Money back on your Christmas turkey! Now who wouldn’t want one of our fabulous free-range Bronze turkeys this Christmas for free? Click here to order your bird with us this month and on Christmas Eve we’ll be giving one lucky customer their money back. Well it is the season for giving after all..
We’re delighted that this year all our turkeys are once again bred and raised outdoors by our poultry farmer Stuart on the picturesque Castlemead Farm in Radstock, Somerset. So how does it all work? Once the birds have led a happy and healthy life, they are processed and hand finished on the farm where they are dry plucked (rather than wet plucked), allowing them to stay fresh for as long as possible. Turkey has a bit of a stigma attached to it as being a dry meat but this simply isn’t the case with Stuart’s birds. 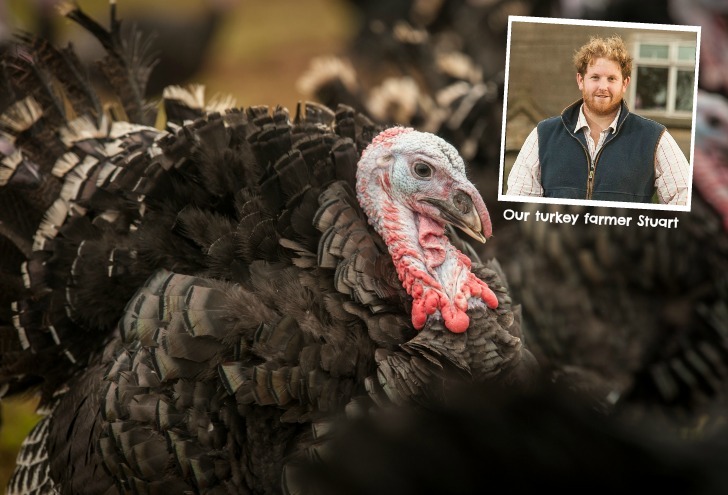 All of his turkeys have been allowed to fully mature at their natural rate so they come in all different shapes and sizes; an immature turkey (that you will find in the supermarket) not only lacks texture, flavour and conformation, but it also misses the hard fat needed to self baste when cooking. Not only this, but the birds are then hung between 10-14 days which helps to further mature the meat as the fibres begin to break down making it much more tender and juicy. Everything is done on Stu’s farm, from day one to the day that we deliver it to your door. It means complete traceability and we believe the only way to ensure the highest quality. The end product is unbeatable and something that simply can not be matched in your local supermarket so make sure you make it a field&flower Christmas this year!